Leif Thuresson of the obscure 80’s Swedish group RJF has finally returned, exactly 30 years on from the release of their debut album. 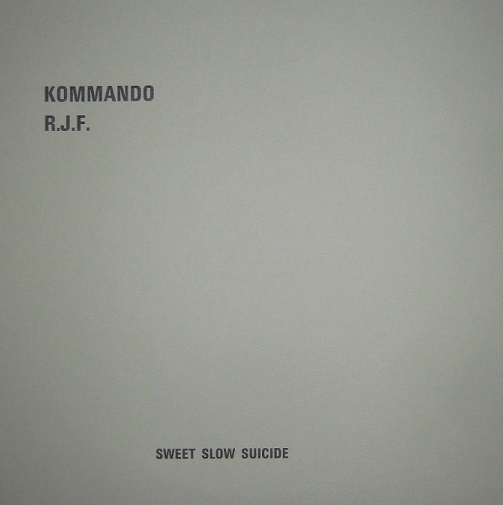 Here RJF have been rebranded with the ‘Kommando’ tag and in place of missing original member Tryggve Persson, Leif has enlisted assistance from Tommy Carlsson and Kristian Olsson – both of whom should need no introduction due to their individual pedigree within the Scandinavian post-industrial scene. To quickly back track, evidently RJF set a high water mark in the Swedish industrial underground by releasing a heralded album in 1983 (‘Greater Success In Apprehension & Convictions’ – reviewed here), before promptly disappearing. Supposedly a second album ‘Roped in Rubber’ was recorded in 1984 only for the master tape to go missing, whilst attempts to record an earlier version of this album occurred as far back as 1991, but for various reasons were not completed. Whatever the actual facts are relating to missing master tapes and aborted recording attempts, time has marched incessantly on, resulting in the sophomore album being finally released three decades on from the debut. Better late then never as the saying goes. From the first rotation is it evident that ‘Sweet Slow Suicide‘ is a punishing album in the best way possible, consisting of stripped back and staunchly analog power electronics. Given that in today’s context the lo-fi experimental electronic minimalism of the debut RJF album is partly showing its age, this new incarnation opts for a different tactic by going for the jugular with a predominantly aggressive power electronics attack. Simple and straightforward in construction, the tracks are built on queasy oscillating electronics, aggressive noise, loose rhythmic bass tones and distortion scared vocals. Noting that the overall sound and attitude encapsulates a ‘classic’ power electronics sound, in actuality it is a sound which is is often attempted but rarely nailed as solidly as this. Likewise despite the general simplicity of the tracks, the wavering distortion, crescendos of noise and harsh vocals are delivered with both power and conviction for maximum sonic impact. Although no details are provided as to who did what on this album, this is ultimately irrelevant when dealing with an album of this calibre. Plain text on two printed inserts rounds out the minimalist visual side of the album and its 300 edition mirrors the limitation of the debut album. A mandatory purchase. This entry was posted in 2013, Posh Isolation, power electronics by noisereceptor. Bookmark the permalink.